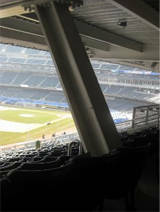 Obstructed views in the New Yankee Stadium? That’s not what I like to hear. The Yankees spent so much money on this new ballpark, and they couldn’t come up with a better design? It looks like there will be support columns going down the right and left field lines on the main level of the stadium. That just isn’t right. Many fans will be putting down a lot of money for some of these seats and they will have obstructed views. These aren’t the best seats in the house by far, but that doesn’t mean they shouldn’t get to see the game like everybody else. The support columns aren’t the only problem. 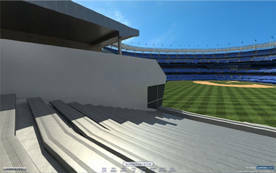 The huge restaurant in center field will obstruct the views of many fans in the bleacher seats. It looks like they will miss out on home runs hit to the opposite side of the ballpark. According to people close to the project, the restaurant will “only” obstruct the view of about 300 people. But don’t worry folks, they’re placing TVs on those walls so people can watch what they’re missing in real life. Everyone just loves going to a game to end up watching half of it on TV. I can’t wait for the new stadium to open up, but this isn’t encouraging news. I can’t judge how it will really be until it’s all completed. I will have to see it for myself.